1. The structure that develops from the ovary wall (*pericarp ) as the enclosed seed or seeds mature. A fruit may be classified as succulent or dry depending on whether or not the middle layer of the pericarp (the *mesocarp ) develops into a fleshy covering. It may be further classified as dehiscent or indehiscent according to whether or not the fruit wall splits open to release the seed. 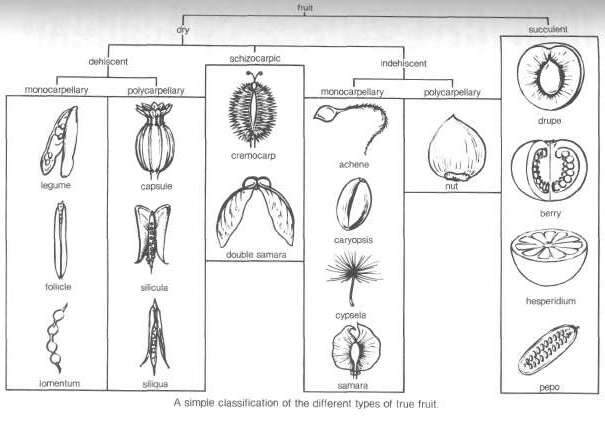 Fruits that develop from the gynoecium of a single flower are termed simple or true fruits (see illustration for the main types of true fruits). If they are derived from a single ovary they are termed monocarpellary while those that incorporate a number of fused ovaries are termed polycarpellary. An *aggregate fruit may develop from an apocarpous gynoecium. The fruit may incorporate tissues other than the gynoecium (see pseudocarp) and some fruits may develop from a complete inflorescence (see multiple fruit ). In some cases a fruit may develop even though the ovule has not been fertilized (see parthenocarpy). 2. Loosely, any of various fleshy structures that may be associated with a gymnosperm seed, such as the succulent *aril of yew (Taxus baccata) or the fleshy ovuliferous scales of some members of the Podocarpaceae, such as junipers (Juniperus).